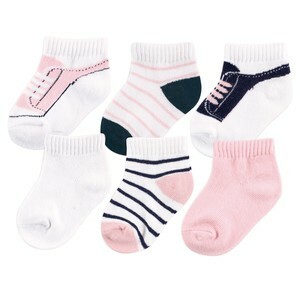 Yoga Sprout No-Show Ankle Socks are a cute and stylish accessory for your baby that look perfect with any outfit! Made of 78% Cotton, 20% Polyester, and 2% Spandex, these socks are soft and gentle on baby's skin, but durable and machine washable for everyday use. This value pack offers 6 different pairs of socks all with coordinating colors and fun designs that will brighten your baby's wardrobe. Wish the packaging was better on all socks. Too many tiny plastic pieces to cut off and then causes hole in socks.